QualityCentral (QC) 1.0.1.16 is now available for download. If you use the QualityCentral automatic download, you will be prompted to download the new Windows client the next time you start the QualityCentral windows client. This a new version of the QC client that ships with Borland Developer Studio 2006, also known as Delphi 2006, C++Builder 2006, and C#Builder 2006. Authors of reports that have been promoted to the internal bug tracking database (RAID) can now change the status of the report as well as edit it. Sysops level 2 and above can also change the status of a report. When changing the status (opening or closing) a report you will be presented with a text entry field for your comments. What you put in that comment box will be sent to RAID for the R&D/QA Engineers to read. QualityCentral has supported automatic notifications for quite some time, but many people are not aware of this because the browser client does not yet have support for configuring your notification options. 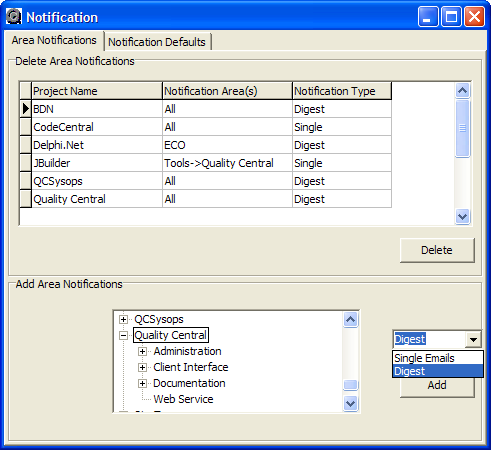 Default Notifications have now been added to the QualityCentral Windows client. 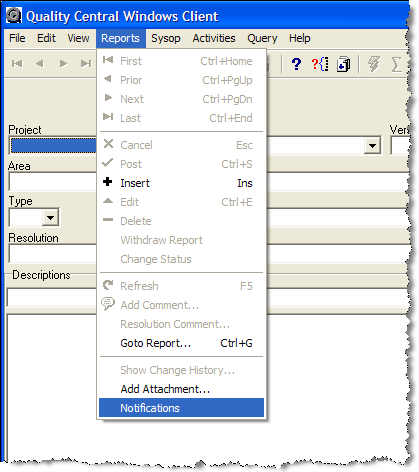 (QC#30377) The QC Windows client menu option for this feature is Reports | Notifications. The first tab of the dialog that appears allows you to specify your preferences for area notifications, as shown below. As you add notification options, your choices are displayed in the grid above the area viewer. The second tab allows you to specify notifications based on actions you take in QualityCentral from this point forward, regardless of what client you happen to be using. 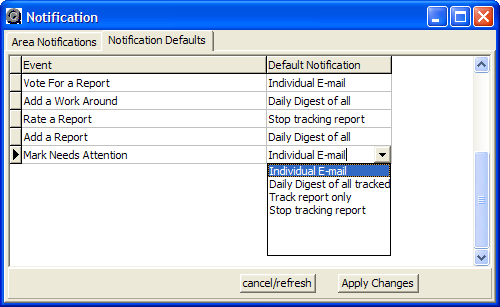 This allows you to specify what kind of default tracking you want on reports when you perform certain actions. The Default Notification feature was implemented as stored procedures and triggers in the database. If you set the default notification for the 'Add a Report' event to 'Single Email' in the QC Windows Client, and add a report with any client, the new report will still have its default notification set to 'Single Email'. if you want to modify your default notifications, you will need to modify them with a client that supports changing them. You can get your dataset of defaults from the web service, modify them, send them back for updating. The notify_events column values comes from the lookup table, with the value NOTIFY_EVENTS. A new project has been added to QC called 'QCSysops.' This project can be used for QualityCentral sysops to communicate privately with other sysops. All reports created in this project are private. All sysops have access to this project. A new version of the Java client for QualityCentral has also been released. This is primarily a bug fix release. A variety of minor issues were addressed, along with the following major bugs. The "Add Report" dialog is no longer modal. Top Votes and Top Ratings queries return reports from the correct project. The list of existing QC reports that were closed in response to this release can be seen at the URL below. You can run it as a stand alone application or as an OpenTool in our Primetime-based IDEs (like JBuilder). You must read the Java client user guide to get the client running.